Given the growing divide between STEM and the arts (despite the somewhat anemic push to embrace the STEAM – STEM plus art – acronym/approach), Robert Brain’s ambitious new book, The Pulse of Modernism, reminds us that the line between art and science has always been thin. Brain’s findings demonstrate that the ways of knowing that characterize the sciences may influence art but that artists take up these ideas and adapt them for their own social, intellectual, political, and economic purposes. Robert Brain’s The Pulse of Modernism: Physiological Aesthetics in Fin-de-Siècle Europe deftly argues that experimental systems (e.g. instruments, techniques, and processes) mediated the relationship between art and the lab far more than scientific writing (e.g. journal articles and monographs). Brain emphasizes that “physiological aesthetics” represented more than just the “extension of physiology to a new domain of human function… art.” The artists at the core of this study did not uncritically take tools or techniques from the laboratory. Instead, they used the insights and techniques of physiology to rethink form, rhythm, and abstraction in addition to thinking in new ways about perception, empathy, and the entire “human sensorium.” In this account, modernism emerged from new ways of thinking about the body and human senses. Brain locates his book at the intersection of a broad spectrum of disciplines including art history, literature, science studies, the cultural history of science, and medical history. Although he does not follow Bruno Latour’s methods explicitly, the anthropologist and theorist’s influence is clear throughout the book—to the point that Brain defines his own work as an “historical sociology of translation” (xviii). Insights derived from Michel Foucault and Henri Bergson also shape Brain’s thinking about duration, temporality, and disciplinarity. However, the theoretical discussions of laboratory work or aesthetic experience neither distract from nor obscure Brain’s larger objectives. At first, the book’s organization appears to reaffirm the science-art divide. The three chapters that make up part I, “Experimentalizing [sic] Life,” outline the development of graphical measuring and recording devices. Brain identifies the late nineteenth century physiologist and scientist’s rush to create graphic representations of their findings as an essential factor in the shift toward disciplinary thinking. These graphic representations of various findings became both a method of science and an entire imaginary that shaped a generation’s approach to scientific knowledge. After an exploration of the ontology and epistemology of graphic representations of natural processes, Brain turns to a detailed discussion of instruments that recorded physiological processes over time: the myograph (measuring force produced by muscle), sphygmograph (blood pressure measuring device), and others. These machines created complicated lines and curves that corresponded to, or promised to correspond to, a mathematical function. This function conferred legitimacy and objectivity to this particular way of understanding the world. Brain then pivots to a discussion of the rise of the theory of protoplasm as a “prime case of turning an ‘epistemic thing’… into a feature of the natural world itself.” Protoplasm, the “nitrogenous, semifluid, elastic substance that could be found in the cells of all organisms,” provided scientists and artists with a way to explore heredity, the nature and limits of life, and the body’s own recording medium (37). By blending the science of energy and life, researchers who worked on protoplasm posited that protoplasm recorded and transmitted the body’s sensations or impulses over time. Work on protoplasm allowed scientists interested in evolution to begin to think about duration as an important factor in evolution. The book then moves away from measuring traces of biological life in the pulse or protoplasm to measuring traces of cultural life by recording speech as physical act. Brain explains that late nineteenth-century French linguists embraced the laboratory as a key site in the development of experimental phonetics. With the help of various tools and recording devices, scholars began to study language as a physical act that combined movement, vibrations, breathing, and more. These instruments recorded language not as written signs but as lines and curves. In Brain’s account, these insights contributed “a new kind of human science” that located a social bond in the linked vibrations of human speech and the human body (or protoplasm). The four chapters that make up part II, “Experimentalizing [sic] Art,” examine the ways in which visual, literary, and performing artists adopted insights from the laboratory into their work. Charles Henry’s “singular influence” on late nineteenth century artists derived from the ways in which his scientific aesthetic allowed artists to make use of the insights of physiology with only a basic understanding of the scientific practices. Brain argues that this appealed especially to artists ready and willing to “dissolve” artistic forms into algorithms. The examples of artistic instruments, like an aesthetic protractor and tables of rhythmic numbers, that are included in the book underscore the era’s fascination with scientific practices. Brain avoids making the kind of general, non-specific “zeitgeist” claims that plague many efforts to connect science and art. Instead, Brain has clear evidence of both direct and indirect connections between artists and physiologists. This allows him to make much stronger claims about the intention behind various art pieces and the artist’s understanding of protoplasm, linguistics, and more. Brain studies artists in a wide variety of mediums, including the painters Edward Munch, Georges Seurat, and Francis Picabia, Futurist poet F.T Marinetti, avant-garde dancers, and musicians. The breadth of Brain’s analysis should be commended—he found the influence of physiological systems across art forms and artistic movements and his close readings of images, texts, and dances explicitly reference the insights discussed in the first portion of the book. Although the first part appears to focus only on the history and anthropology of the laboratory while the second section provides lengthy analysis of art, Brain expertly weaves art and science together throughout the book. He is deeply attuned to the ways that these various apparatuses produced images that always required dual readings—both of the intellectual content (e.g. scale, continuities and ruptures, etc) and what he terms a “sensible intuition” of the graph (e.g. the quality of the line, its form, rhythm). This kind of dual reading is exactly why laboratory systems appealed to creative artists and it is this insight that allows Brain to make his larger claims about modernism and physiology. The book raises interesting questions about the political possibilities that artists and scientists ascribed to these new techniques. For instance, Brain explores how Seurat’s painting techniques fit into a larger political ideology and economic system. His findings about the art market and artists’ attempt to use insights from physiology to control the viewer’s response to a piece (and by extension their desire to purchase the piece) point in intriguing ways to the material constraints facing these experimental artists. Physiological aesthetics promised to give the artist some control over their position in an insecure art market outside the salon system. However, he does not extend this kind of analysis to many of the other artists who he focuses on. If the book has a weakness, it is that Brain does not consistently articulate the political and economic factors that shaped the production and reception of these new, avant-garde works. It may be difficult to teach from The Pulse of Modernism because of the enormous breadth of topics, methods, theories, and sources that Brain mobilizes over the course of his investigation. However, with careful scaffolding and pairing with related texts, the book could prove a useful addition to an upper-level course. The very characteristics that may limit its use in a classroom make it an excellent book for researchers. Medical historians and historians interested in the social history of science, medicine and/or the body will also find this book useful. Brain’s descriptions of the development of specific tools and the evolution of various scientific ideas nicely compliment the book’s cultural analysis. 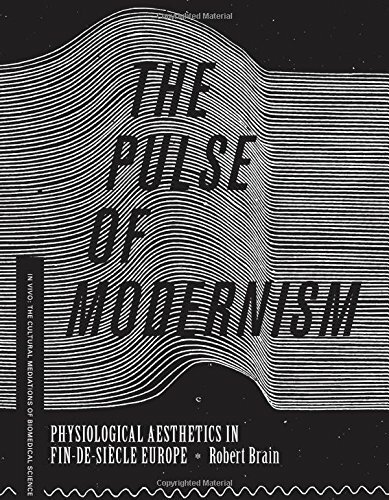 The Pulse of Modernism, especially its first section, provides a model for a cultural history of science deeply attuned to the theoretical questions around knowledge, representation, and recording. Literary scholars and art historians will find much to recommend this book. Not only does The Pulse of Modernism provide an excellent historical background to today’s discussions of bio-art and bio-design, it raises important questions about the periodization of and influences on modernism. Ashley Bowen-Murphy is a PhD candidate in American Studies and Public Humanities at Brown University. Bowen-Murphy A. Robert Michael Brain’s “The Pulse of Modernism: Physiological Aesthetics in Fin-de-Siècle Europe”. Somatosphere. 2016. Available at: http://somatosphere.net/2016/robert-michael-brains-the-pulse-of-modernism-physiological-aesthetics-in-fin-de-siecle-europe.html/. Accessed April 24, 2019. Bowen-Murphy, Ashley. 2016. Robert Michael Brain’s “The Pulse of Modernism: Physiological Aesthetics in Fin-de-Siècle Europe”. Somatosphere. http://somatosphere.net/2016/robert-michael-brains-the-pulse-of-modernism-physiological-aesthetics-in-fin-de-siecle-europe.html/ (accessed April 24, 2019).